With Amazon breathing down its neck, having acquired a small retail pharmacy, Walgreens Boots Alliance introduced an interactive digital platform that allows its millions of mobile and online visitors to find and get healthcare anytime, anywhere. In July 2018, it debuted “Find Care Now,” where consumers can talk to a doctor, find an in-store clinic, talk to a therapist, and get dermatological care online. The platform lists prices for the services, before insurance, and it lists the nearest locations and wait times. Walgreens and other brick-and-mortar retailers are concerned that Amazon will expand deeper into healthcare. With this new digital marketplace, Walgreens can stress its ties to local healthcare providers, which the online giant hasn’t got — yet. It also serves to grow its omnichannel role as a trusted and convenient destination. Walgreens worked with agency true[X] to spread awareness of this service and to educate people on what Walgreens can do for them. True[X] created a video campaign that gave readers of such premium digital video publishers as A&E, Fox, and Turner the option to eliminate regular commercial ads if they spent a minimum of 30 seconds interacting with the Walgreens engagement ad. 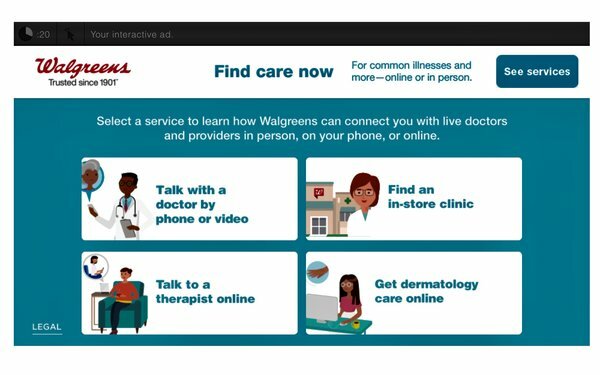 Users could learn about a variety of Walgreens’ “Find Care Now” services, showing off its relevance to a broad demographic of users. Those who clicked through were directed to an information page, which lists a description of the service and common reasons for its use. An outstanding 28% click-through rate. The average user spent nearly double the minimum amount of time required to spend with the ad. Brand awareness rose by 14% among desktop users. A strong lift was driven throughout the funnel. Give consumers an option that rewards them, i.e., letting them skip ads if they spend a small amount of time with yours. Put premium video publishers in your media plan in order to get the right audience. Make the product user-friendly and easy to understand with a minimal amount of words and artwork. Position your brand as a problem-solver and go-between to vital services, not just a vendor of products. Brands need to integrate into and play a role in people’s lives. The best antidote to Amazon is to go local and live — emphasize the brand’s connection to communities and provide human, not automated service.